Follow the Chelan County Fire District #3 Facebook page for the latest updates. Chelan County Emergency Management has issued the following notification for our area due to changes in wind direction on the Cougar Creek Fire. 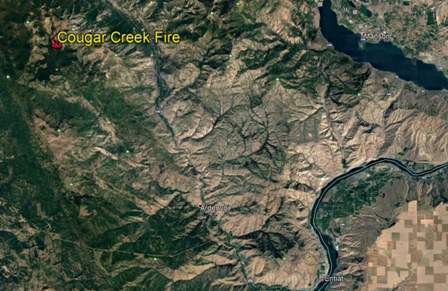 More information can be found on the Cougar Creek Fire Inciweb site: https://inciweb.nwcg.gov/incident/6053/ as through the Cougar Creek Fire - Chelan Co., Washington Facebook page. This is only a fire advisory for residents in the affected areas. The fire management team is working concurrently on both the Entiat drainage and the west flank of the fire. Due to prevailing winds changing from the SW to the N/NW, the fire is currently pushing to the SW. Cooperating agencies and the Incident Management Team have made the decision to initiate this Level 1 Fire Advisory for the above areas. Call the Fire Information number for more information at 509-664-9210"